The entry system is online and only takes a few minutes to navigate. For each entry, you will be asked to fill in a URL or upload a file(s). Since each entry is judged on its own merits, in most cases, no accompanying materials or explanations are necessary. For categories involving campaigns, a brief-summary or overview should be included along with creative product. Each entry will have a box for permission to display the entry in the winners list and website gallery. If permission is not granted, the entry will be seen only by the judges. The competition is open to all individuals, companies and organizations involved in producing any type of project involving the web or digital media. To be eligible, an entry must have been produced after June 1, 2016 (two-year window). dotCOMM entry fees are the most reasonable in the industry. Many entrants take advantage of the relatively low cost by submitting multiple entries for various clients. Instead of charging several hundred dollars per entry like other creative competitions, entry fees are $95 for most categories, and $175 for plans, campaigns and training modules. If an entry is submitted in more than one category, an additional entry fee is required for each time it is entered. Only one pro bono entry is allowed per client. Multiple pieces count as one entry. An entrant however can have up to three pro bono clients. To qualify, work must have been performed without any compensation. It is ok for the nonprofit or others to have paid for hard costs such as materials. Pro bono entries will be judged not only on creativity, but the extent of donated effort. If only pro bono work is submitted, the entrant must pay regular entry fees. Entries are judged at random and not compared directly to other entries in their categories. There could be no winners or multiple winners in a category. Work is evaluated solely on its own quality, creativity and resourcefulness. There are no lengthy essays to persuade the judges. Judges base their decisions on learned perceptions of creative excellence rather than an entrant's imaginative explanation of an entry’s value. In some cases, such as a plan or campaign, there may be a need for additional materials. Since there is a tremendous variance of resources from entrant-to- entrant, and piece-to- piece, perceived budget is taken into consideration in the judging. Based on their work experiences, judges have an expectation for each individual entry. A student-produced project is not held to the same expectation as a piece produced by a Madison Avenue agency for a Fortune 500 company. Judges verbalize their criticisms, compliments etc. and then agree on a score. Entries receiving scores between 90-100 points are Platinum Winners. Entries with 80-89 points are Gold Winners. Entries scoring from 70-79 receive an Honorable Mention certificate. dotCOMM Awards recognizes that many of the entries are internal or proprietary in nature, or are done for the government or another company. So, unless permission is granted during the entry process, entries will not be displayed in the winner list or gallery and only the judges will see the work. dotCOMM Awards assumes that entrants have all permissions and rights associated with the entry. No entrant information is sold, traded or made available to a third party. 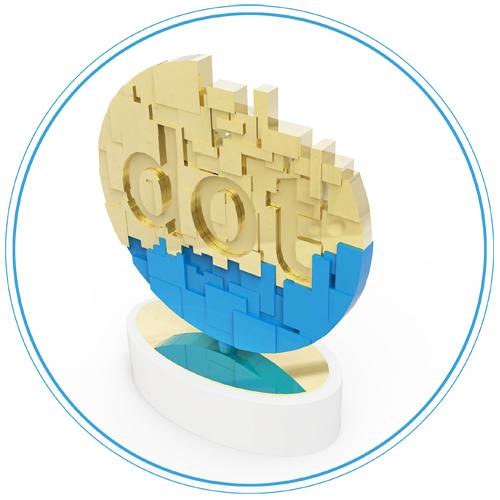 The dotCOMM trophy is designed to pay tribute to the evolution of the web and digital technology. The award is a metal cast dot broken up into individual digital bits. The three-dimensional dot sits above an oblong marble base that has a plate inscribed with the winner’s information. The award and base total eight-inches tall. The award is platinum and blue for platinum level winners and gold and blue for gold winners. The casting is six and one-half inches tall, six-inches wide and three-quarters inch thick. The award is presented in an elegant, Tiffany-style, satin-lined, presentation box. The dotCOMM trophy is crafted by Society Awards, the most prestigious custom design and manufacturing firm in the awards industry. Over the past several years, Society Awards has redesigned many of the world's top creative awards, including The CLIOS, Golden Globes, MTV's VMA, Academy of Country Music and American Music Awards. Unlike most competitions, dotCOMM entrants do not subsidize awards for the winners. Instead of charging up to several hundred dollars per entry, dotCOMM keeps entry fees at a fraction of that cost by giving winners the opportunity to buy their own awards. The result is more affordable entry fees and a higher quality, piece of art that winners and their clients are proud to display in their workplace. Winners for the 2018 dotCOMM Awards will be announced no later than August 1.